Lecia Cushion Chocolate, White and Green will add a pop of colour to your sofas or bed. It is sold f..
Lecia Striped Black, White and Grey cushion. This cushion will add a pop of colour to your sofa..
Peacock pattern cushion mocha with ivory embroidery and mocha background. Dimension: 43.. 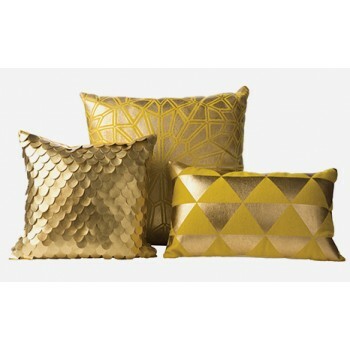 Plain Pleated Taffeta Cushion in bronze is stylish and ideal for most decor types, if you aren't a f.. Plain Pleated Taffeta Cushion in olive green is stylish and ideal for most decor types, if you aren'.. Plain Pleated Taffeta Cushion in orange is stylish and ideal for most decor types, if you aren't a f.. Plain Pleated Taffeta Cushion in red is stylish and ideal for most decor types, if you aren't a fan .. Plain Pleated Taffeta Cushion in teal is stylish and ideal for most decor types, if you aren't a fan..
Three Poppy Cushion Teal with Neutral Background. This cushion is available in the filled and unfill..
Red and Gold Gemstone and Sequins Cushion Small, handmade with gold gemstones and sequins in a circu.. Match this cushion with the rest of your home decor.This item is available in both filled and un..
Grey Round Cushion with Clear Acrylic Button.Color: GreyDiameter: 30cmThis cushion is sold filled on.. Round Decorative Cushion with Clear Acrylic Button.Color : Ivory Diameter: 30cm This cushi..
Red Round Cushion with Clear Acrylic Button.Color: RedDiameter: 30cmThis cushion is sold fil..